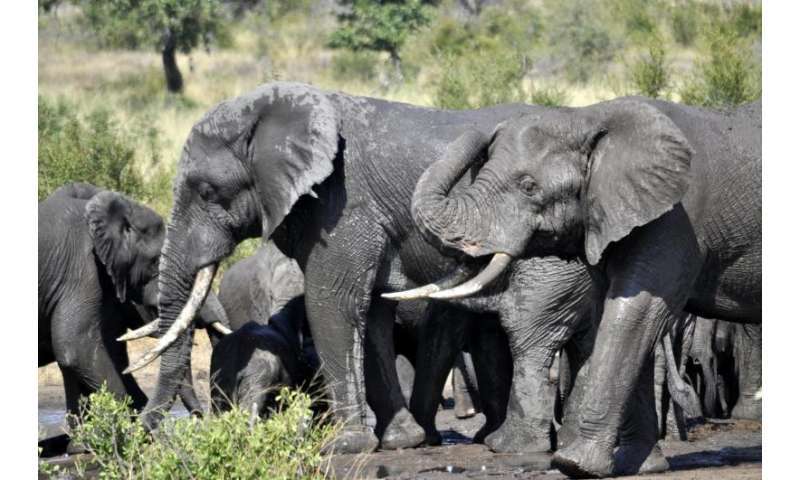 Protected areas, such as nature reserves and national parks, play a crucial role in sheltering wildlife, such as African elephants, from hunting and habitat destruction. But it's important that conservation managers understand how the vegetation in these natural protected zones is affected by the population growth that is spurred by this animal safeguarding. To this end, new work from a team led by Carnegie's Greg Asner examined the effect elephants have on the woody plant life in Kruger National Park, the largest protected area in South Africa, and showed that elephants are one of the preserve's leading causes of fallen trees. "National parks and nature preserves will serve as biodiversity arks as we move into the future," Asner said. "But to manage them properly, conservationists will need to maintain the functionality of the ecosystem as a whole, which will require an understanding of system-wide responses to changing animal populations." The African elephant is emblematic of the challenges facing conservationists. Elephants were once very wide-ranging on the African continent, but population densities have been reduced over the past few centuries due to poaching and habitat degradation. In South Africa, elephants are protected in both public and private reserves, including Kruger's 1.9 million hectares. Once they are introduced or reintroduced into a safe area, their numbers can grow very quickly. For example, over the past 20 years, the elephant population of Kruger has nearly doubled and continues to grow exponentially. While this is undoubtedly good news, conservationists need to be able to promote a sustainable system for managing both the burgeoning elephant populations and the surrounding vegetation. But the large-scale monitoring needed to gain spatial understanding of ecosystem-wide responses to elephant population growth has remained a challenge. Asner and his team used their Carnegie Airborne Observatory to address this problem. Between 2008 and 2014, Asner's team surveyed more than 10.4 million trees and woody plants across 19 landscapes within Kruger using an airplane-mounted Light Detection and Ranging (LiDAR) sensor. LiDAR uses reflected laser light to image vegetation in 3-D. It enabled the team to determine and rank the different factors that caused trees to fall. Their work is published in Ecography. "This kind of mapping and monitoring capability, to track so many millions of individual trees, is really new science," said Chris Field, Director of the Department of Global Ecology. The team examined the environmental, biotic, and conservation management factors affecting fallen trees. They found a mean tree-fall rate of 8 trees per hectare (or 12 percent of trees per hectare) every other year, which is considered very high in savanna ecological predictions. The team expected topography and soils to be contributing factors behind observed geographic patterns in tree-fall rate. And they were. But their findings also revealed another major factor in play: the density of the landscape's elephant population. Fire frequency was another contributor, but it was half as important as elephants in determining tree-fall rates. "We know that Kruger has, in recent years, been undergoing changes in the size and distribution of its trees and other woody plants," Asner said. "Our findings suggest that these changes are, to a very large extent, driven by elephants. Since the population will continue to increase, our results will aid Kruger in addressing and managing the way the elephant population is shaping the park's vegetation." Beyond improving reserve management, the team's findings will aid in predicting how the rewilding of landscapes with large mammals alter ecosystems. In turn, this knowledge contributes to a better understanding of how the extinction of large mammals such as mammoths, ground sloths, and diprotodons (the largest marsupials in history) at the end of the Pleistocene Epoch affected the period's ecology and shifted its landscapes. In a separate paper published by the Proceedings of the National Academy of Sciences, Asner and a different team of researchers explored the links between the way Pleistocene extinctions affected vegetation and the current threats to large herbivores, such as elephants, and the outstanding questions regarding how to best manage their habitats. "A combination of modern and paleoecological approaches can greatly improve our knowledge of animal-habitat interactions, and the best ways to conserve biodiversity in an age of rapid extinction," he said.